Newly found iPhone users often face the problem of setting their own ringtone. In phones on Android OS, you can put your favorite melody instead of standard sounds in a couple of clicks. But in the "apple" gadgets so easy to change the melody will not work. That is why in this publication we will explain in detail how to put the ringtone on iPhone. The main condition for a successful installation is that the melody that you want to put on the iPhone call should use the format m4r and does not last more than 40 seconds. Under other conditions, nothing happens, so you need to be careful and follow this. You must first select and download the file of the desired audio composition in iTunes. Then you want to reduce the duration of the melody to just 40 seconds. Then you need to convert the file in AAC format. After that, you can upload the file of the prepared audio composition to iPhone using the method of synchronization with the same program as mentioned above in the list. Install ringtone on iPhone (5s, 6 and other models). Now we will consider each stage in more detail. The subscriber is required to open iTunes, and then go to the “Music” section. This can be done by pressing the note icon, which is in the upper left area. After that, you need to click on the "File" section, and in the open menu, click "Add a file to the library". The downloaded item will be displayed inside the library. Now the subscriber needs to reduce the duration of the audio composition to 40 seconds, since under other conditions it will not be possible to install a ringtone on the iPhone 5s. You can perform this procedure using online servers, or special programs directly on your phone. First you need to right-click on the name of the audio file, and in the opened menu select the "Mixing" section. After that, the properties window will appear, where the subscriber needs to open the “Parameters” page. Then in the “start” and “stop” fields you need to specify the part of the melody that you want to cut out from the full audio composition. In addition, the duration of this part should not be more than 40 seconds. Having specified the time interval of the melody, you need to click on the "OK" button. Having determined the composition interval, its file must be converted to the required ringtone format. Regardless of the iPhone model, be it 3, 4s, 5s, etc., the subscriber needs to right-click on the name of the composition, then, in the pop-up menu, click on the line “Create AAC version”. 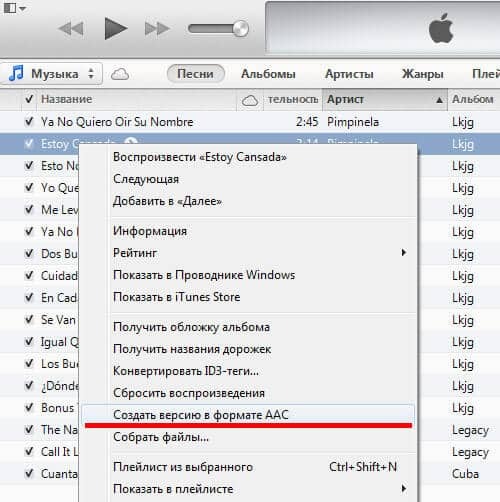 If, on the smartphone, the installed version of iTunes is installed, first select the file, then open the “File” menu, then click on the “Create a new version” line and then select the “Create AAC version” option. After that, the conversion of the element will start, as a result of which a file with the same name, but of shorter duration, will appear below. Then click on it with the right mouse button and in the window that appears click on the item "Show in Windows Explorer". After opening the explorer window, you need to change the extension of the element from m4a to m4r. After that, by minimizing the explorer window, you need to return to the program menu and visit the “Sounds” section. Then from the explorer window you need to drag the ringtone element to the program window. 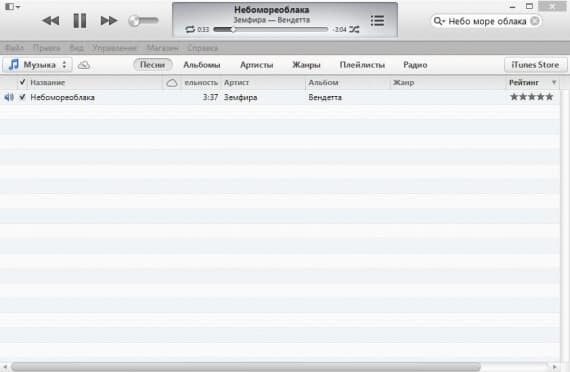 You need to wait for the moment when the file is displayed among the list of ringtones. In circumstances where the iPhone 5s is not yet connected to a PC, it must be connected via a USB cable. After that you need to click on the icon of the device in the top panel of the program. Then in the left panel you need to click "Sounds". In the right window put a tick "Sync sounds." Then you should synchronize the device by clicking on the "Apply" button. By synchronizing your smartphone, you can set your favorite songs to the call of your gadget. Open the "Settings" on your smartphone. 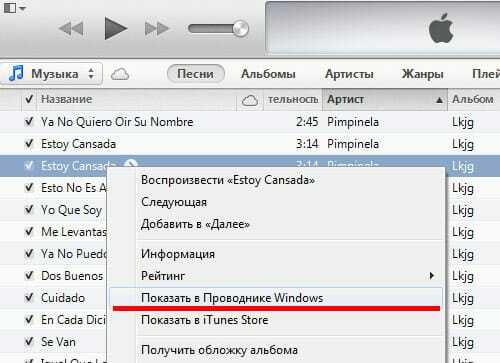 Among the points of the appeared window to find and click on the "Ringtone". Between the presented ringtones, select the desired one and then click on it, as a result of which a tick appears next to it, which indicates the change of the previous call to a new one. Put the ringtone on iPhone 3, 5s, 6 and so on can be the same principle. The procedure for all smartphone models is exactly the same. Also, it is worth remembering that the downloaded melody should be in the format m4r. Appsgames⟾Useful iOS⟾How to set your own ringtone on iPhone?